Nolan Reimold is headed to Norfolk. 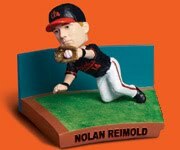 In other news, May 26 is Nolan Reimold Mini Bobblehead night at Camden Yards. Yeah, how exactly can the Orioles give out a bobblehead for a player who's not even on the starting team? Is this just another bad idea from the worst team in baseball?